Named Dyer’s Polypore with good reason, this beautiful bracket fungus is filled with pigment – good, strong, gold pigment. It’s an annual, meaning it grows for one season, then dries up, only to come back in the same place next year. It looks like this when it’s young, when the white edges appear almost fuzzy. As they get older, they become a rich, reddish brown. Young phaeolus give a rich gold colour, while the older ones give a darker golden brown. I found a huge, sodden Phaeolus in the forest last week, so I boiled it for an hour or so, then strained the bits out for the dyebath. This is what resulted – the skeins were mordanted (l to r) with copper, alum, and iron. That’s a silk scarf (tie-dyed) in the middle, and at the bottom are silk noil and a piece of unknown silk, both unmordanted (added as an afterthought). I love the rich, rich gold of the top skein in this image. That one I dyed with a young Phaeolus, still with the band of white at its edge, and I couldn’t believe the colour! The three skeins at the bottom are from the dyepot I talk about above – the light gives a better rendition of their colour in this image, but now the mordants are (l to r) alum, copper, and iron. The small skeins are from November’s mushroom workshop; the three on top from a fresh mushroom, and the three on bottom from old mushrooms, whose colour wasn’t very intense, for some reason. On my walk through the woods today, I found another little patch of pink coral mushrooms, so they’re simmering away in the mud room – perhaps this is the one that will give me a real Purple! I stumbled upon your website and have lots of questions. 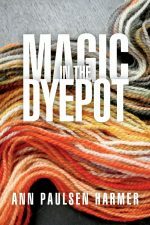 As a Santa Cruz Fungus Federation Member and avid sock knitter I am interested in learning more about dyeing wool with Popypores. Most of the people around here seem to be majoring in silk. I love the rich color you are getting and wonder if dyeing items that have already been knitted up with ‘blank’ super wash wool is a go? Your stuff is beautiful! P.S. We have a big annual fungus fair every January, (our 37th this year). Hi – it’s always good to hear from another mushroom dyer. And as you’re from Santa Cruz, you must know David Arora. He told me about the beautiful displays you prepare for your mushroom shows – I’d love to see some photos. I encouraged members of our new mushroom club – the Sunshine Coast SHROOM – to make up some display baskets for our last festival (our second annual), and they did seem to attract a lot of attention. As to your question about dyeing super wash, I don’t know, as I’ve never tried it. If you do, let me know what happens. The dyer’s polypore has so much pigment, it should do something, and I’ve noticed that the cotton thread I use to tie up the skeins picks up some of its colour, whereas in other mushroom dyes it remains white. I hope you get some good results from your dyepots. My first batch of Phaeolus-dyed fiber is drying on the line right now and I’ve just found your blog. It’s a good day for me! My wool and silk picked up a bright mustard yellow that is just spectacular. I’m so excited. Off to peruse the rest of your blog, I’m so happy to have found it. How exciting! Phaeolus is one of the most gratifying fungi to dye with, because it seems to be made of pure pigment. Have you tried another exhaust of the same dyepot? I always rush the young ones straight into the dyepot because their colour is so intense. As they age, the colour gets duller – still rich and beautiful, but just duller. Stay in touch – I’d love to see other results from your mushroom dyes. Beautiful colours! We’re still waiting for our lobsters to peek through the moss, but now that I hear rain is expected later in the week, I have high hopes. I’ve subscribed to your blog, and I’m looking forward to seeing your next dyepot results.